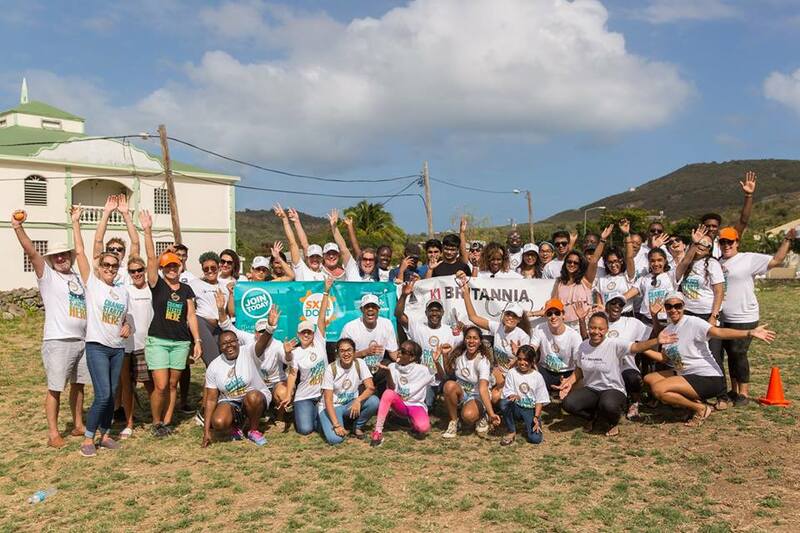 Philipsburg, ST. MAARTEN – After almost 11 consistent months of disaster relief activities, K1 Britannia Foundation is rounding off their Irma-focused activities. Since the day of Hurricane Irma on September 6th, 2017, the foundation has been busy with immediate, mid and long-term relief. Forty-eight (48) hours prior to the passing of hurricane Irma, realizing her imminent threat but unsure of what to expect, K1 called upon its volunteers who had indicated interest in assisting in disaster situations to be prepared in case they were needed in the relief efforts. Within 3 hours of Irma’s passing, volunteers and the Coast Guard met as planned and quickly realized initiative had to be taken. After being made aware after the hurricane that there was no emergency food or water for shelters, places of refuge that had taken in vulnerable people, and care institutions, K1 managed to within 24 hours secure enough supplies with the security of the Koninklijke Marechaussee and Dutch Caribbean Coast Guard to sustain roughly 2,000+ people in the above mentioned institutions as well as aid workers and law enforcement personnel. Bregje Boetekees, Operations Manager at White and Yellow Cross Care Foundation expressed gratitude to the foundation stating “I want to call out what a wonderful organization K1 is — filled with people who truly care for others. I know many of the helpers that came out from K1, they themselves had losses and had to endure a hard time after Irma, but nobody hesitated to put on their boots and put their shoulders under the load for something that was completely disorganized and in disarray and with the energy and the impact that they did. That is amazing and I know that there are thousands and thousands of people on St. Maarten who received help only because of K1 and for that we are very grateful”. From that first day forward for the next 5 weeks, the foundation, as a consistent team of 20-40 volunteers worked tirelessly alongside the Dutch Caribbean Coast Guard, Dutch Marines, Dutch UNDAC, international relief organizations, and government, specifically ESF 7 – VSA to help the people of St. Maarten. The foundation became known as the main reliable source of volunteers for relief initiatives and took on the responsibility of leading volunteer efforts in the areas of first response and rapid assessment of all places of refuge and care institutions on Dutch Sint Maarten; set up and management of shelters; mass distribution of relief goods; amongst other relief activities. 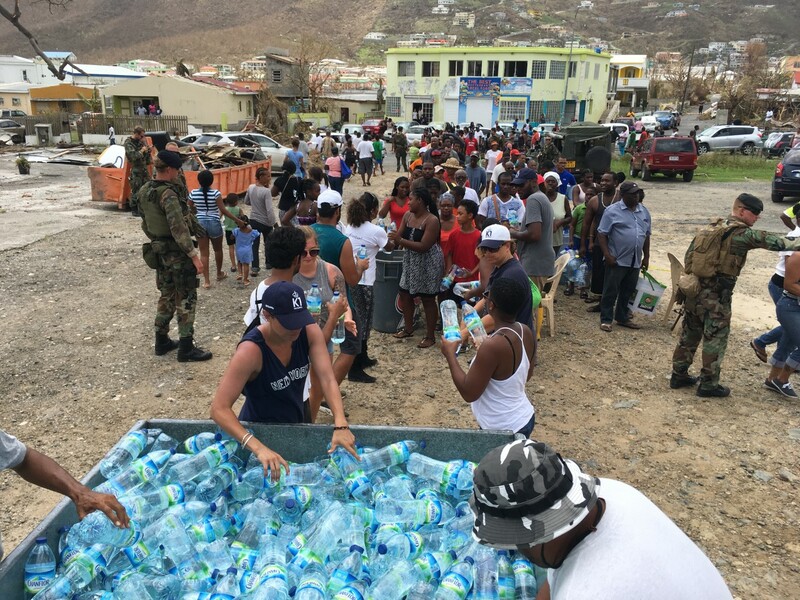 K1 alongside key partners like the Dutch Marines and the Dutch Caribbean Coast Guard held a total of 23 mass and mini distributions through which over 21,000 persons were assisted with food, water and supplies. Once the mass distributions were finished, over 400 food and water packages with the help of Prime Distributors were made to assist the elderly, soup kitchens and hard-hit neighborhoods. Deputy Director of Key Partner, Dutch Caribbean Coast Guard Eugene Middelhof said “K1 is well organized and have proven their ability to ensure that the ones that are in need of assistance are taken care of. Their intentions are genuine and their results speak for themselves”. Volunteers set up multiple shelters by cleaning and sanitizing them as well as managed 4 emergency shelters for 48 hours prior, during and post Hurricane Maria. 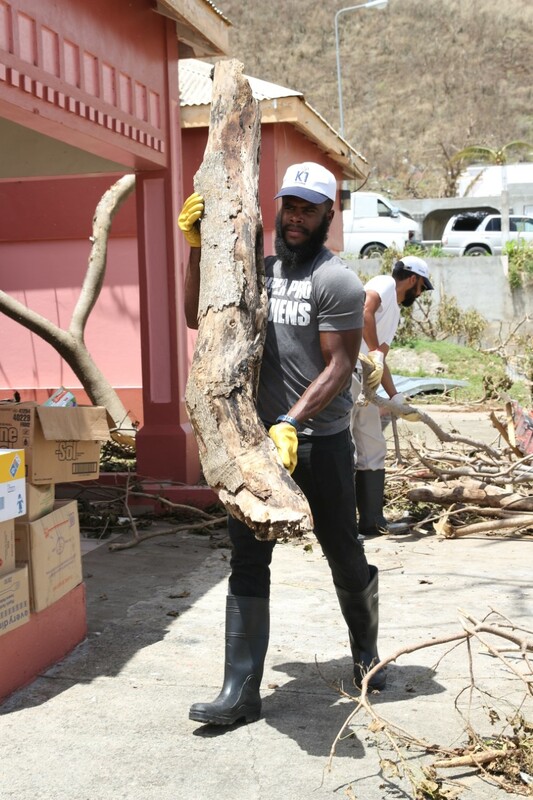 After hurricane Maria, K1 also sent a team of volunteers to Dominica. Some of the ways they assisted were in the set-up of tents to be used as temporary classrooms while schools were being repaired, assessment of shelters with the International Organization for Migration, trauma counseling, assisting with food distribution, etc. Locally, K1’s volunteers were on call for ESF 7 during the weeks and months after hurricane Irma, assisting in responding to the myriad of needs and challenges that presented themselves during those challenging times. “K1 Britannia is dynamic, attentive to the needs of the people, very much out there in terms of consistency and making sure that persons are helped in whichever way possible. I’ve not seen such as a strong and continuous action of young people in a long time, they have not stopped for one single minute, it has been an ongoing effort. No matter how often they are called, they are always ready to work, and they have worked in my view even longer than I’ve worked, in terms of the amount of hours being put in right after the storm. I think the organization shows the resilience of this community, it is embedded in these people, and with this type of continuous efforts and determination, I think we will bounce back sooner than we anticipated” said Ms. Joy Arnell, Secretary General of the Ministry of Public Health, Social Development and Labor (VSA) and ESF 7. Over 20 local organizations and shelters who help vulnerable groups such as foster children, elderly, sick, mentally ill, at-risk youth, those made homeless through Irma, etc were adopted by K1 Britannia and they visited each of these places immediately after Irma to see what was needed as far as food and water, supplies, medical help, etc. Each organization was consistently supplied with food, water, hygiene and baby supplies, etc. until they were able to get back on their feet — for some places this was from immediately after Irma until the end of January. This help enabled these organizations and institutions to stay functional throughout this difficult period where those they cared for needed their help more than ever. The focus of the foundation has always been helping one of the most vulnerable groups of youth on the island, children under protective custody, foster children. Court of Guardianship director Mrs. Richelda Rodriguez – Emmanuel said “In the aftermath of Irma, K1 proved their dedication and reliability in caring for the youth of St. Maarten. 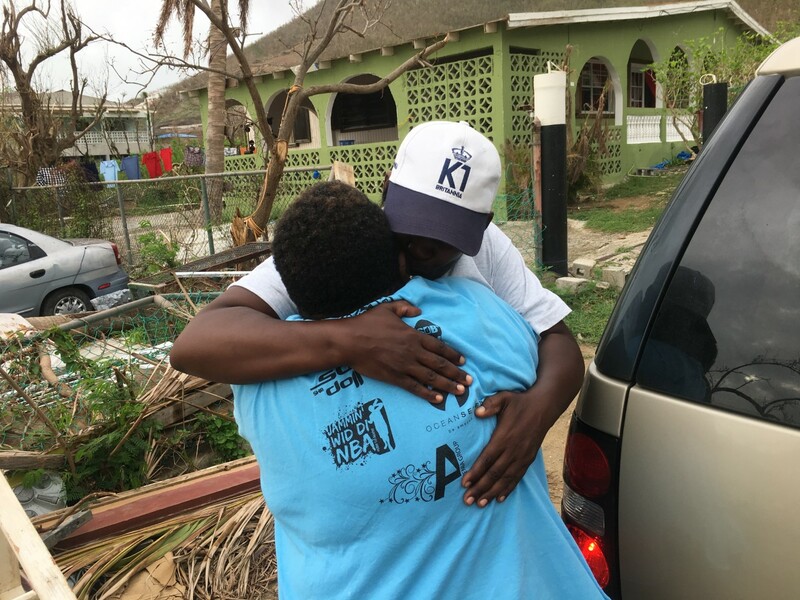 Within the first 72 hours of the passing of the hurricane K1 conducted rapid assessments and first response to the group foster homes and acted to meet their needs. In the weeks that followed, they provided food, water, clothing, blankets, furniture, and other necessities to these institutions and to the SJIB for over 90 minors under protective custody measure”. Lack of electricity and food supplies hampered many persons from providing hot meals for themselves in the weeks immediately after Irma. So with the help of a volunteer chef, 400 hot meals were distributed to needy neighborhoods, the elderly, afternoon school programs, foster homes, etc. From December onwards, the focus was on procuring the material help these institutions needed, as most had suffered damages and needed new equipment, furniture, and other materials. The local community organizations and needy families received material help such as 100+ couches, 300+ chairs, 500+ pillows, 10s0+ comforters, office furniture etc. Some six organizations catering to children received construction assistance, done by local youth along with international volunteer contractors. Helping these community organizations was a way to reach some of the most vulnerable in the community. International donations were also facilitated through the foundation to help some of the community organization rebuild. Targeting the children on the island, over 25 primary, high and afternoon school programs received water, milk, food supplies, 35,000+ high energy biscuits, hygiene products, can liners, blankets etc. for the needy students and the school. 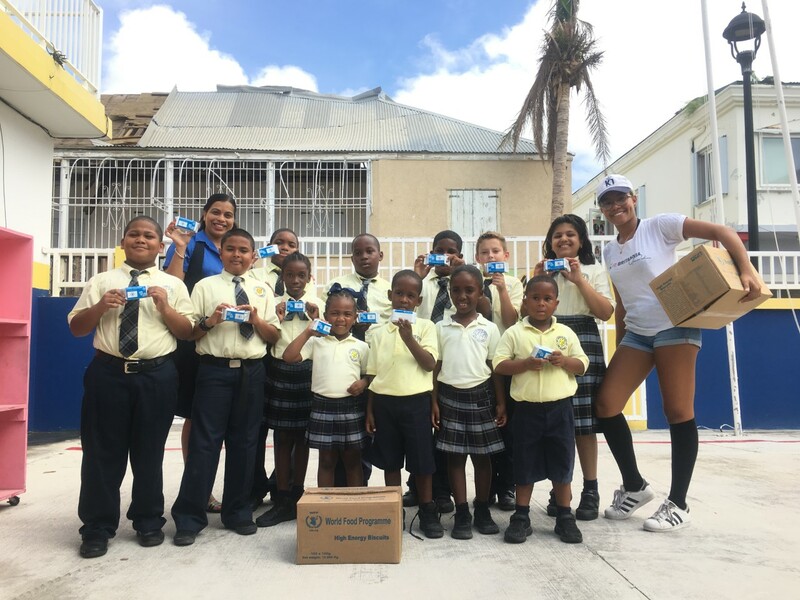 The St. Maarten Early Childhood Development Association (SECDA), responsible for 20+ daycares also received assistance such as hundreds of baby food packages, 700+ bottles of milk, 5500+ liters of water, food, blankets, hygiene products and more. As a way to bring tourism back to the island and help reestablish the positive image of St. Maarten, the foundation has connected over 50 international volunteers since Irma who wanted to help with a local need and have been an invaluable help to K1’s relief and rebuilding programs. The plans are to turn this into a permanent international volunteer program. “Priya and her team truly seem to care and do the right thing under difficult circumstances with no time for own agendas. A property that Dutch Marines wish to relate to! If in the (unfortunate) event the island needs our help again, we look forward to closely working with the K1 Britannia Foundation again!” – Andries Broersma – Major, The Royal Netherlands Marine Corps (RNLMC). K1 Britannia Foundation is soon to announce their long term plans in collaboration with key partners for ongoing disaster relief and preparedness both for St Maarten and the Caribbean region, as after Irma it has been decided that disaster relief will remain one of strong focuses of the foundation. 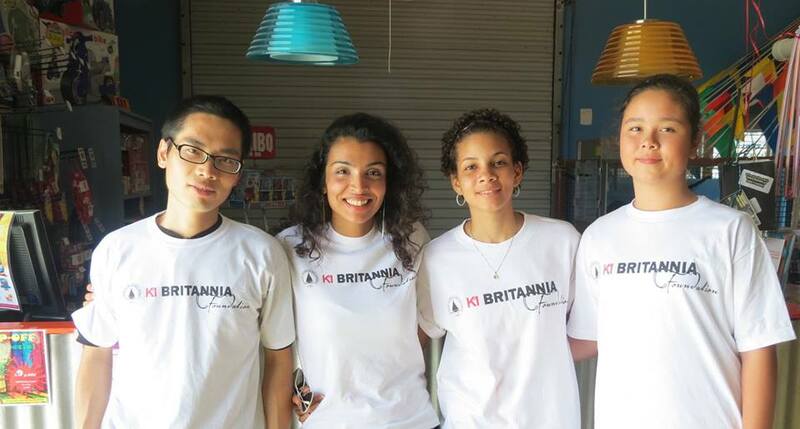 For more information about K1 Britannia Foundation and to see a day-by-day journal of the first 28 days after Irma, and weekly updates afterwards of Irma and Maria relief activities visit their website www.k1britanniafoundation.org. A documentary covering the foundation’s experiences post-Irma is soon to be released. The foundation can be contacted via email at foundation@k1britannia.org or by sending a message to their Facebook www.facebook.com/k1sxm.